We have 4 long leading indicators fluctuating around the points where their ratings change. This past week they fluctuated in a positive direction. 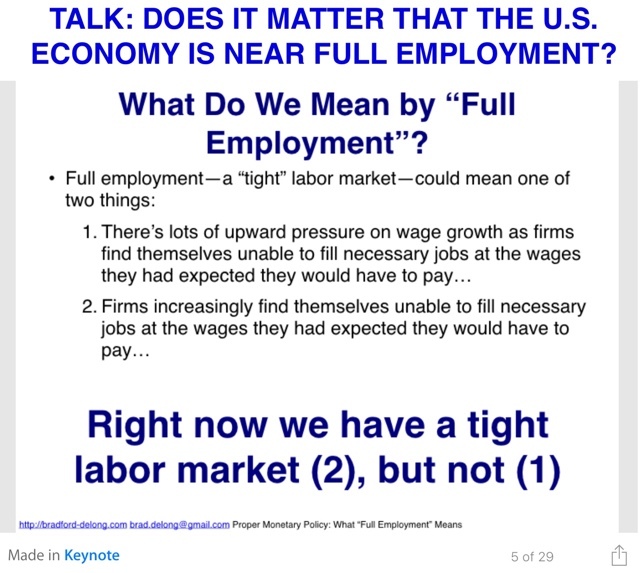 As usual, clicking over and reading doesn't just inform you about the likely path of the economy going forward, but it rewards me a little bitty bit for putting together the information. I think I may have mentioned once or twice that I am a nerd, right? So, last year during hurricane season I got hooked on a site called Tropical Tidbits. 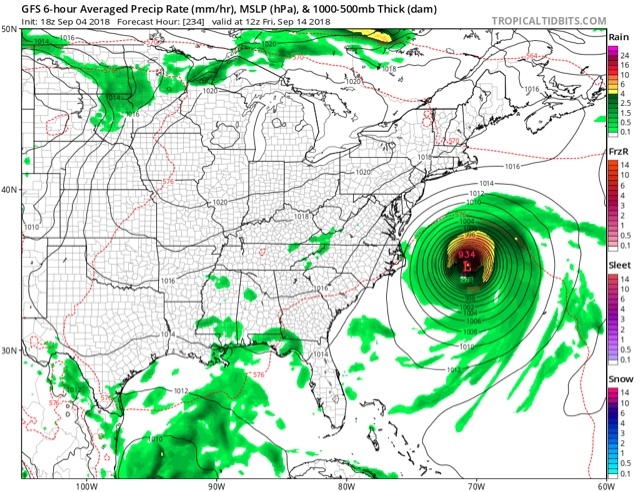 The neat thing about this site -- well, from a nerdy point of view -- is that it posts the GFS model forecast, updated every 6 six hours, for the next two weeks! While you normally don't hear forecasts more than five days out, I noticed that frequently the forecast even 10 or more days out can come pretty close. Winter or summer, if the model says there's going to be warmer temperatures and a low pressure system, then it's pretty darn likely that there's going to be warmer temperatures a low pressure system. It just might be 800 miles away from where the model says it will be. 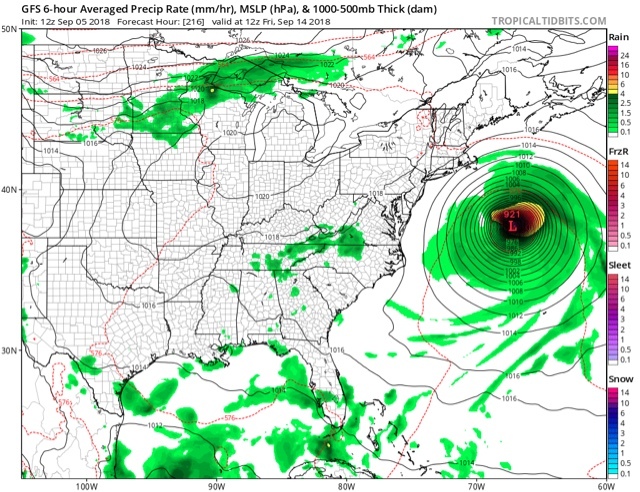 For example, one model run put hurricane Jose directly over New York City about 12 days later! Needless to say, that disaster was averted -- but Jose ultimately did pass about 600 miles southeast. That's Florence, about 300 miles off the Outer Banks. 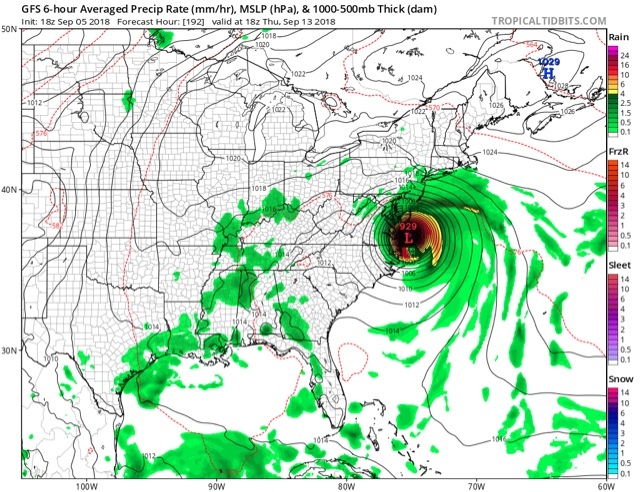 The latest run has the hurricane making landfall late thursday over the North Carolina outer banks and heading northwest. In short, it increasingly looks like this: draw a triangle anchored by Bermuda on the southeast and by the Appalachians on the West. Take out the south-easternmost 1/4 of the triangle closest to Bermuda. 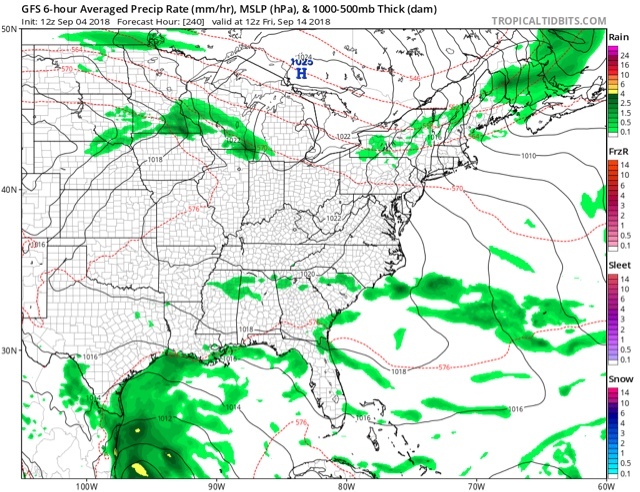 Florence is going to be somewhere in the remaining 3/4 of that triangle next Friday. 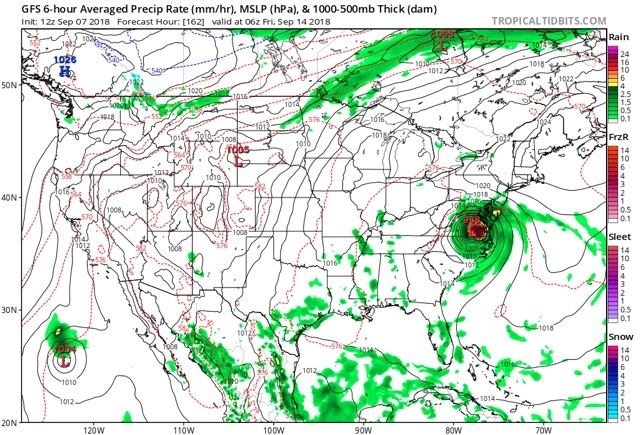 By the way, although I don't have a screenshot, the European model as of this morning had Florence coming ashore near Charleston, SC. 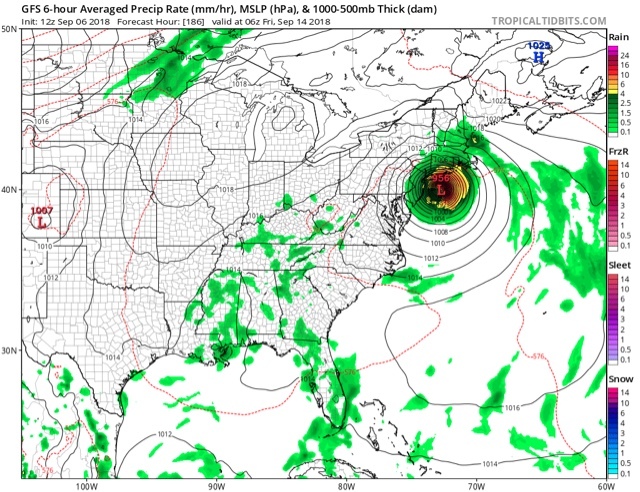 Next Friday could be a very bad day somewhere on the east coast. (P. S. I think Iwill update this periodically over the next week and see how well the model does). 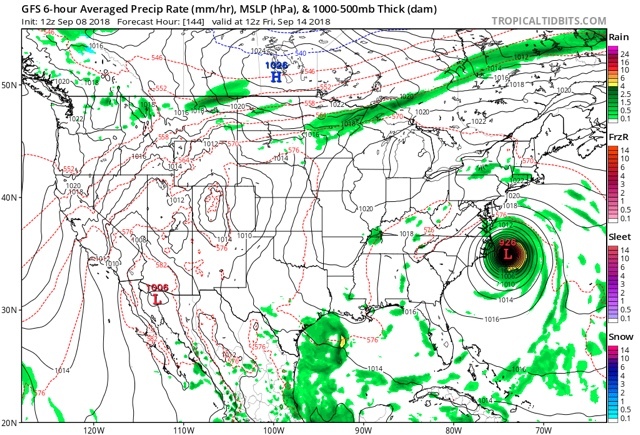 the Euro model, however, continues to show the hurricane track further sourth with a landfall of a major hurricane between Myrtle Beach and Charleston, SC. Manufacturing jobs fell -3,000 for an average of +21,000/month in the past year vs. the last seven years of Obama's presidency in which an average of 10,300 manufacturing jobs were added each month. June was revised downward by -40,000. July was also revised downward by -10,000, for a net change of -50,000.
the average manufacturing workweek was unchanged at 41.0 hours. This is one of the 10 components of the LEI. construction jobs increased by +23,000. YoY construction jobs are up +297,000. temporary jobs increased by +10,000. the number of people unemployed for 5 weeks or less increased by +117,000 from 2,091,000 to 2,208,000. The post-recession low was set three months ago at 2,034,000. Professional and business employment (generally higher-paying jobs) increased by +53,000 and is up +519,000 YoY. the index of aggregate payrolls for non-managerial workers rose by 0.4%. the alternate jobs number contained in the more volatile household survey decreased by -423,000 jobs. This represents an increase of 2,071,000 jobs YoY vs. 2,330,000 in the establishment survey. Government jobs decreased by -3,000.
the overall employment to population ratio for all ages 16 and up decreased -0.2% from 60.5% m/m to 60.3% but is up 0.2% YoY. The labor force participation rate decreased from 62.9% to 62.7% and is down -0.2% YoY. This was a mixed report with an overall positive tone. Most of the negatives, such as the prime age employment population ratio simply gave back the very good numbers from last month and returned us to where we were two months ago. Still, several leading components did decline, such as short time unemployment, past revisions, and employment as measured by the more volatile household survey. The positives showed continued improvement in some problematic areas. Most importantly, nominal YoY wage growth for ordinary workers increased to an expansion high of +2.8%. Involuntary part time employment continued to fall, as did the broad underemployment rate. Overall, we continue to make progress, and so long as short term leading indicators of consumption continue to do well, so should employment. 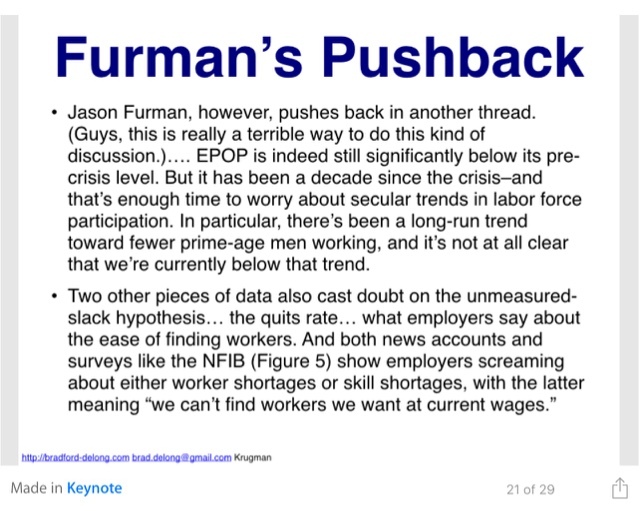 I have a new post, "Producers are Hot*, but Consumers Maybe Not," up at Seeking Alpha. in which I contrast the white hot ISM manufacturing report with the lackluster motor vehicle sales and residential construction -- the two biggest durable consumer purchases. 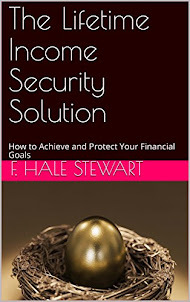 As usual, not only is reading it hopefully informative, but also compensates me a little bit for the work I put in. July residential construction spending: pause or peak? While the ISM manufacturing index came in very hot this morning (I'll wait for graphs to update before I discuss in any detail), residential construction spending continued its recent flatness. Its reading in July, while up from June, was below that for February, April, and May. It is apparent that the rate of growth of both is still positive, but has very much decelerated. In fact, the YoY% growth in residential construction spending is the lowest in 6 years. Residential construction is consistent with both a pause in housing growth, and a cyclical peak. House prices are likely to continue to rise, putting more pressure on housing. So the big question is, what happens to mortgage rates in the next few months? 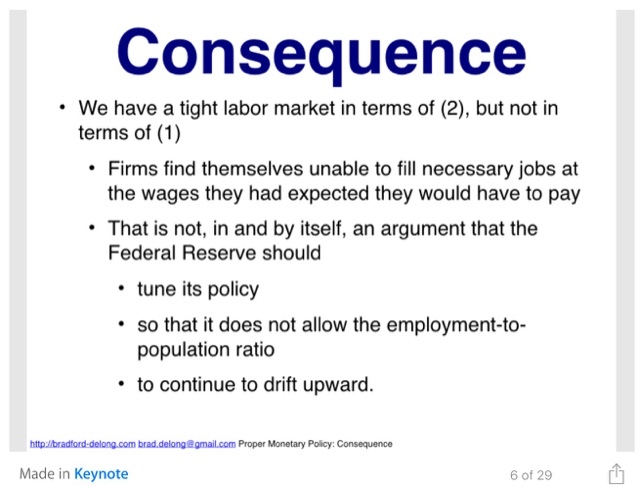 For Labor Day Prof. Brad DeLong posted a talk on the implications (or not) of the US being near "full employment." My only significant quibble here is that "Job Openings" rates from both the JOLTS reports and the NFIB (Small Business) survey have been soaring for over 2 years. If employers knew that they had to pay higher wages to attract workers, but didn't want to be locked in, why would they bother posting the job openings at all? 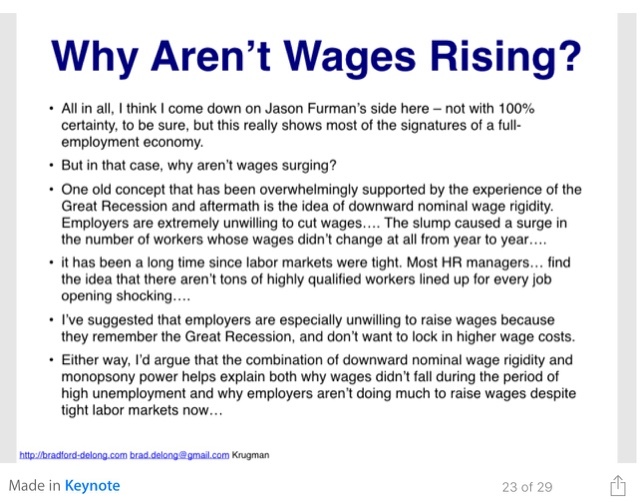 That, to the contrary, they are posting job openings at record rates strongly suggests they *haven't* learned yet that they must pay higher wages. [A] Pew Research assessment ... [using a] validated voter survey (they matched voter file with the survey respondents) showed white women narrowly preferring Trump to Clinton by 2 points - 47 percent to 45 percent. ... the Pew data suggests white women have always been, at best, ambivalent about Trump. ... Clinton won (white college-educated voters ) voters by 17 points! ... if you compared Trump’s current standing with the Pew data[,] Trump took 38 percent of college-educated voters in 2016, and his current standing with these voters is….37 percent. Their vote preference in 2016 (38 percent Trump to 55 percent Clinton), pretty much mirrors their vote preference for 2018 - 39 percent Republican to 54 percent Democrat. Mike Podhorzer, AFL-CIO’s political director, suggests that ... [w]hat really distinguishes a Trump-supporting white voter from one who doesn’t isn’t education or even gender, it's whether or not that voter is evangelical. Podhorzer’s analysis leads to two conclusions. First, ... Trump’s base is evangelical white voters, regardless of education level. Second, white non-evangelical, non-college women are the ultimate swing voters. It's fairly clear that the justification that evangelicals have for supporting Trump is that, no matter how vile he is personally, no matter how many laws and norms he flouts, he is being used by God to do God's work. More: Oh? And when the last law was down, and the Devil turned round on you — where would you hide, Roper, the laws all being flat?